We love apps. We talk about them every day here at Android Police, we write biweekly roundups featuring all the cool new apps that are getting released, we choose our top 7 new apps every month, and once in a while we tackle a specific category of apps and show you some interesting choices in it. Apps are an intricate part of what we do here and how we use our devices in general, they're inextricable from our Android usage. So when Google released its list of Best Apps of 2015 and we noticed some generic and automatically generated recommendations in it, we thought we could try harder. Since apps are a personal choice and there isn't an objective way to classify them against each other, even in a given category, we decided to skip the "best" tag and instead share with you our team's favorite apps this year. Unlike the roundups we posted yesterday of the best 20 apps of 2015 (and games), these apps here didn't have to be new, popular, extraordinary, the best, or fit in any other limited scope. They're just our personal picks, the ones that we've actually used and enjoyed this past year. 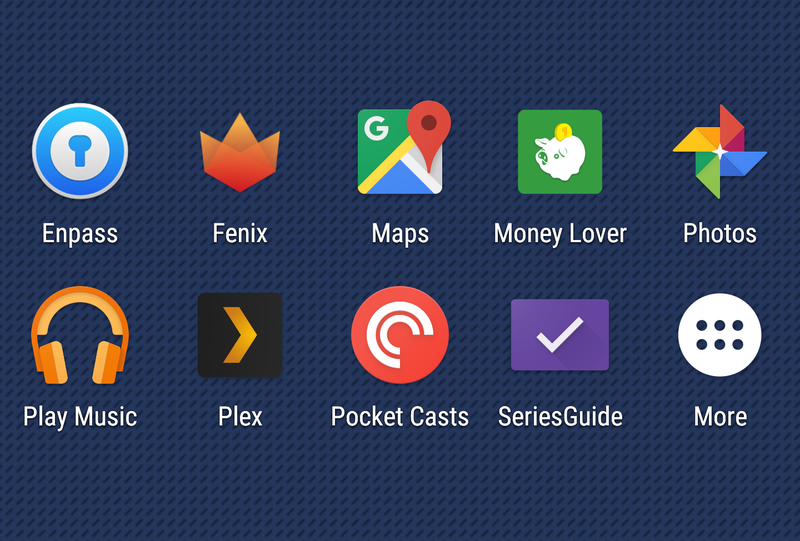 I test about a dozen apps each week, but those that I use daily remain slightly unchanged from last year: WhatsApp, Pocket Casts, Fenix for Twitter, Playboard, Todoist, Series Guide, Link Bubble. However, HomeUX has replaced my Aviate launcher obsession, Apple Music and Deezer both came on my radar for online music, and I recently installed Pujie Black and fell in love with it for Android Wear watchfaces. Although I use all of the apps mentioned above, my favorites this year aren't in that list but below. I've struggled to find a capable finance manager that doesn't rely on bank and credit card connections, supports multiple currencies and wallets, syncs across platforms, doesn't look like an eyesore, and isn't very expensive. After trying over twenty alternatives, I landed on Money Lover and was hooked. It does everything I ask it to do. 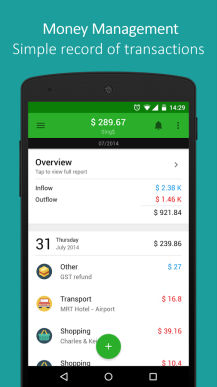 It can even tag expenses by location or person I'm with, manage debts and loans, create a specific event/travel mode to file all of my expenses under, add recurring bills, help me stay within budget, and draw nice and informative graphs. Best of all? $5 for the Premium account unlocks it on Android, iOS, and the web. For several reasons too long to list here, LastPass isn't a good fit for me. Other sensitive data apps are either limited in their platform support or cost too much to get the entire gamut of clients. I'd been sticking with SafeWallet hoping for a better alternative until I discovered Enpass. On the desktop, Enpass is free and its clients (Mac, Windows, Linux) have a nice UI, keyboard shortcuts, and a Chrome extension. 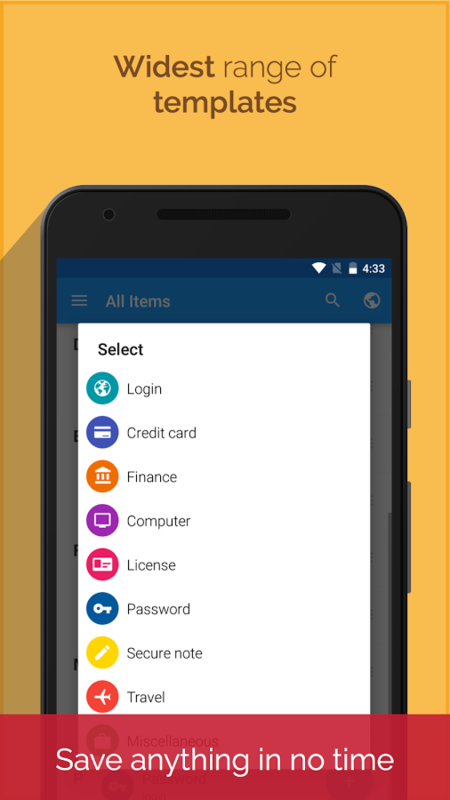 On mobile, Enpass has a $10 fee for both Android and iOS, a beautiful and simple interface, plenty of security features including fingerprint unlocking on Marshmallow, and customizable folders, card types, and fields. The AES-256 encrypted file syncs via Bluetooth or your choice of Dropbox, Google Drive, or other services. It might not be the most elegant topic to mention, but period tracking is a problem women (and often their partners) have to deal with. Until Clue, I had to stomach an assault against human senses and interface design in each app I tried. Then Clue made period tracking elegant, simple, painless (ha! ), and effective. 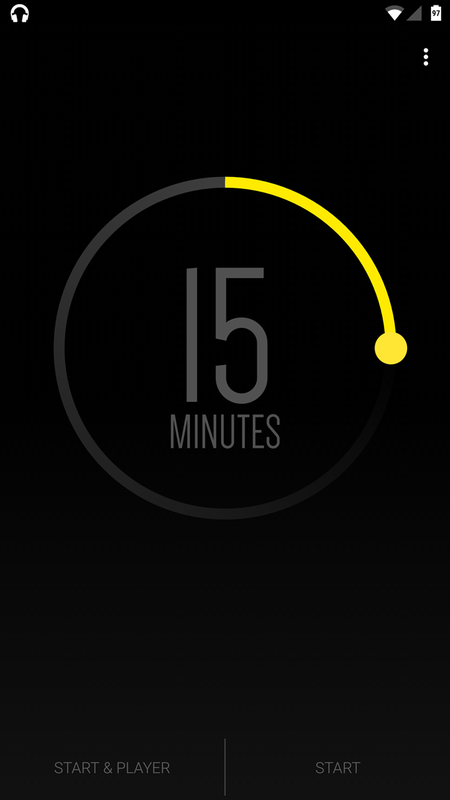 With continuous updates to add account sync, history, reminders, the app has even gotten better and better. 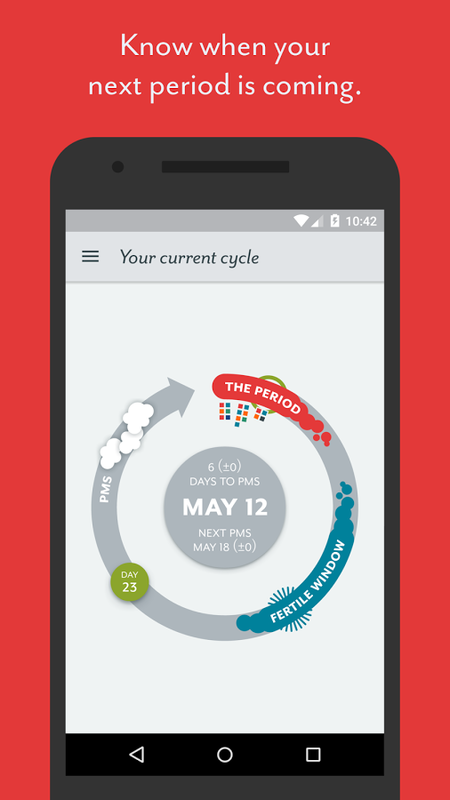 It continues to be my first recommendation when my friends and patients ask about period tracking apps. A lot of what I do involves writing whether it's emails, speech preparations, fictional stories, personal lists, or articles on Android Police. Those words stay synchronized across devices as .txt Dropbox files, and Jotterpad is the way I read and edit them on Android. The app has everything a writer needs: night mode, built-in thesaurus and rhymes dictionary, keyboard shortcuts, undo/redo, Markdown support, and multiple text layouts. And its best feature is how the entire interface disappears so you can just focus on writing. Doesn't everyone use Google Maps? Why waste a slot talking about it then? Because Google Maps has officially become my best friend while driving ever since it added traffic data in Lebanon. In a country where traffic is highly capricious, with horrible infrastructures and erratic road changes, random protests, and almost inexistent public transport, having a tool that shows you as accurately as possible which streets to avoid is priceless. It's the difference between getting stuck for 4 hours on a bumper-to-bumper highway or taking the longer scenic but empty route. And that's why it's now my trusty co-pilot everywhere I go. I have a conflicted relationship with mobile apps. The nature of what I do for Android Police requires me to spend an inordinate amount of time with Google's own collection, and sometimes it's easier to stick with something from that pool than to put much effort into alternatives. On top of that, I don't want to recommend apps if I feel like they're not well-built and thoughtfully put together; but I tend to be hyper-aware of missing features and design flaws, so very few apps meet my expectations. Let's just say there are a few popular apps I've tried to love but I'm drawn to the idea of building my own alternatives that would blow them away. Nevertheless, there are a few that I use so often that they're basically impossible to replace. I have to do factory resets regularly, and the time it takes to reinstall apps and sign into everything is brutal. The App Fill feature in LastPass takes away almost all of the typing and cuts out the trouble of looking up credentials for each site. Bonus points also go to LastPass for implementing fingerprint support for both Android 6.0 and older Samsung phones. Cross-platform support and sync is also vital since they make LastPass and Authy virtually maintenance-free. Organizing a homescreen is an art, and I'm not very good at it. I've turned to using them for grouping apps that I access moderately often; but the apps I use all the time should be front-and-center. That's where SwipePad comes in. I don't have to hit a home button and swipe through different screens or spend multiple taps on folders, I just rely on muscle memory to launch the apps when I need them. I've dabbled with a few streaming services, but each has some kind of compromise that didn't work for me. The combination of Play Music and YouTube is just about perfect for the way I listen. 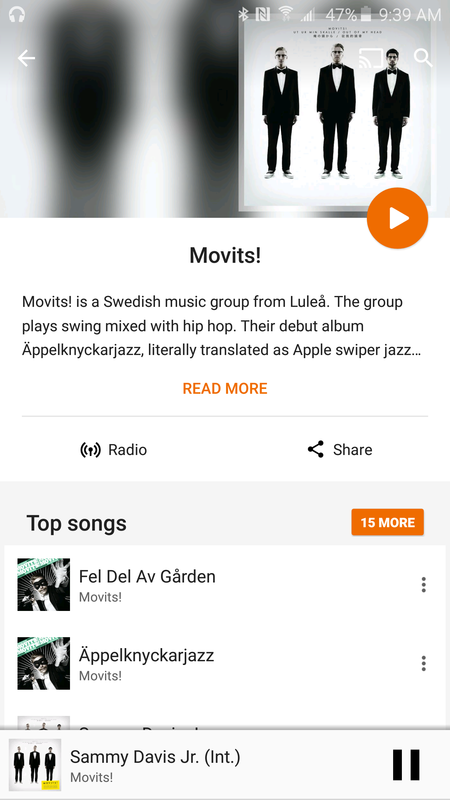 Play Music excels at high-quality sound while the YouTube and YouTube Music apps are pretty good for discovering new music. Both services offer offline storage with a subscription (if supported in your country), and plenty of portability across mobile and desktop platforms. I have to install a ridiculous number of apps for my job, but most of them are uninstalled shortly thereafter. I'm very picky, you see. I can write about an app and explain why it might be good for you, but that doesn't mean I'm going to keep using it. There are, however, some apps that I use consistently without hating myself. Here are three of those apps. 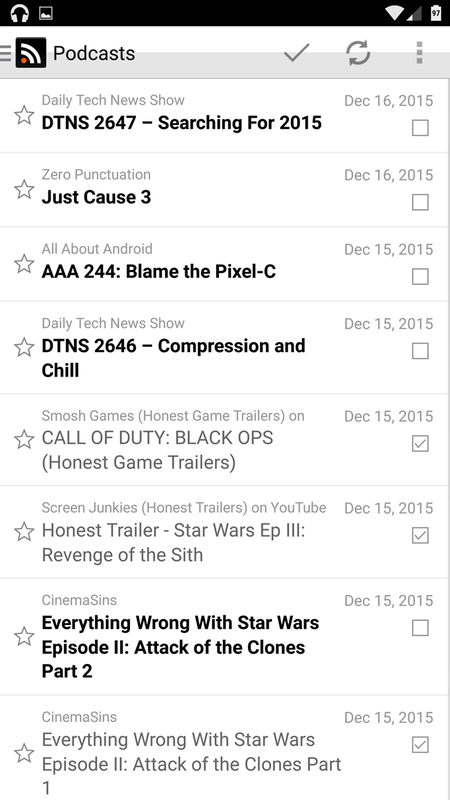 I make extensive use of both Google Drive and Dropbox, and I have certain nitpicky issues with the official apps. When I just need to manage my files on one of these services, I use Unclouded. It has tools to look for dupes, analyze storage usage, and track file stats. The search and file explorer features are fast too. 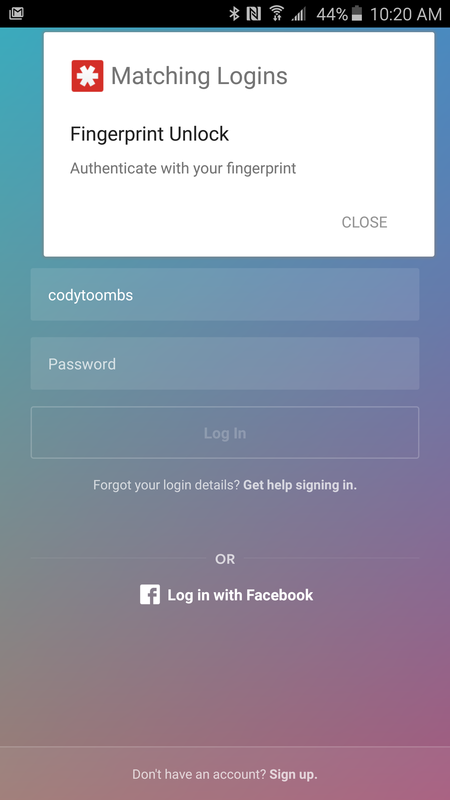 It's a free app with an in-app purchase to unlock multi-account support. Twitter's draconian API limits have squashed many third-party clients, but Fenix is still ticking. I dread the day when it runs out of tokens and development stops, because it's my favorite way to use Twitter. The design makes sense, it's fast, and it's extremely reliable. The use of material elements is a bit more understated than some apps, but it's great at what it does. This one costs $5.49, which I know sounds like a lot for a Twitter client. It's really good, though. I'm not overjoyed with some of the choices Google has made with the Google Now Launcher lately, but luckily I have Action Launcher 3 to fall back on. I probably use it about half the time, which is more than I've used any launcher in the past. I love using the Quickdrawer for apps and the Quickpage for widgets. Then there are the handy Covers and Shutters for icons on the home screen—I use a single-page setup on Action Launcher because it's so damn efficient. The automatic Quicktheme stuff that pulls colors from your background is rad too. 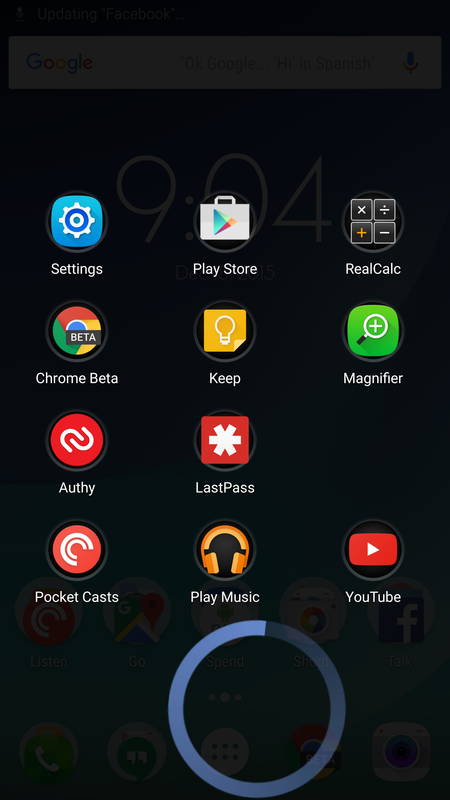 People flipped out when Action Launcher 3 was a paid $5 update, and I think that was pretty foolish. This app is worth supporting. 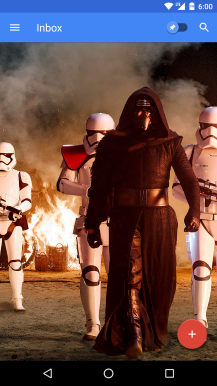 The end of 2015 marked a big change in how I started using my Android device. I decided to go open source. For over a month now, I've been running CyanogenMod and getting apps from F-Droid instead of the Play Store. This meant I didn't particularly have to argue with any of my teammates over which apps I'd get to write about. I spend more time listening to podcasts than I do watching TV and movies or playing music, so I needed a decent app before I was willing to stick around with my open source experiment. As it turns out, AntennaPod is a capable option that looks great and has all of my must-have features (like not downloading or streaming over mobile data). I can't tweak all the things to my liking as I could in BeyondPod, but AntennaPod is good enough for me not to care all that much. I have friends who hate having their picture taken. You probably have a few too. But I hate having blank images in my contact list. 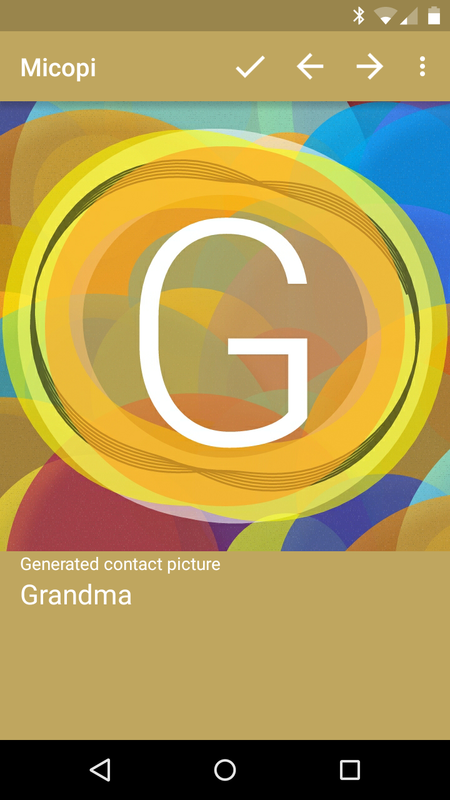 Micopi is a cute little app that generates geometric images based on your contacts' names. This way each person has a unique picture, and I'm not hounding people for their photos. Everyone wins. Long before I made this shift on my phones, I started using DuckDuckGo as my primary search engine. Turns out the Android app is rather nice. It loads up webpages without shooting you out to a dedicated browser. This way I can pull up information quickly without having to come back and close all those tabs later on. OsmAnd isn't nearly as pretty or slick a navigation app as Google Maps or Nokia HERE, but it does have a few strengths. The app lets you download offline maps (pulled from OpenStreetMaps.org) for most of the world for free. I don't like using or being reliant on mobile data, so I'm fond of navigation apps that I know can get me home even if I'm counties away from the nearest interstate. OsmAnd's interface takes some getting used to, but after spending some time getting acclimated, I manage decently well. Just install AddressToGPS if you're going to give it a shot, because OsmAnd is bad at pulling up addresses on its own. When someone asks me to recommend Android apps, I usually have one that I pull out immediately: Airdroid. It's a fantastic way to add easy sharing functionality to any device. On top of that, the apps that I install on every phone and tablet I test or buy are Reader+ (which has transitioned wonderfully from Google Reader to Feedly) and Sleep Timer, a simple little app that's been continuously and competently updated for years. Everything else is transient, though I do tend to keep Mage Gauntlet, Card Crawl, and Threes installed for entertainment. AirDroid is probably a really obvious choice for a "Best Of" Android list, but I don't care, it's that good. Set it up and you can access your phone's file system wirelessly from any desktop browser. View, delete, upload, and move files around at your leisure in a quasi-desktop interface, and extra tools like a screenshot function, remote app installation, and text messaging are valuable bonuses. Sign up for a paid account and you can access your phone from anywhere in the world. This app got its start as a Google Reader client, but after the service's ignominious shutdown, it's been moved to Feedly. The real attraction for me is the excellent scrolling widget, which lets me stay on top of my RSS feeds without ever leaving the homescreen. The app is extremely customizable, and includes options for mobile or full views in the app or direct links to the web for each item. This little tool does just one thing: it turns off any music player after a timer, allowing you to listen to music as you fall asleep without accidentally playing 8 hours of Coletrane. It's not the only one on the Play Store, but it's been going for years and years, and hardly a month goes by when the developer doesn't tweak some setting or internal mechanism. It's a perfect example of the way mobile development and support should be. When it comes to Android, I'm a pretty boring user. I don't do any of the stuff that I did just a few years ago—no ROMs, no "hacks." Hell, I don't even root anymore. Really, I'm not even sure I consider myself a "power" user at this point; I guess it's all about your personal definition of the term. The transition from "what root apps can I use today" to "OK, I'm a normal user now" has really just opened more doors for me to explore the app scene and find stuff that I actually like to use instead of things that somehow modified how I use my devices. You'll find that my favorite apps are a reflection of that—they're just regular apps that do stuff I like doing. Yeah. 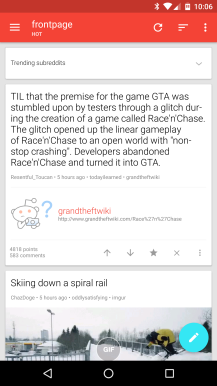 I don't always look at reddit, but when I do, it's generally with Sync for reddit. 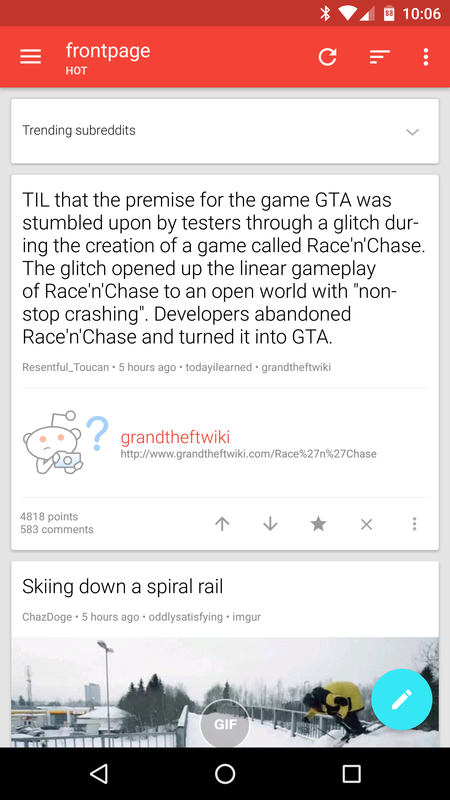 I've tried a ton of different reddit apps, and this is always the one I go back to—it's easy to use, looks great, and makes browsing my favorite subreddits a super quick and easy process. What it boils down to is this: I can look at more memes in less time. If you didn't already know this, I love music. I listen to it all day long as I work, the entire time I'm in the car, and basically any other time I can. 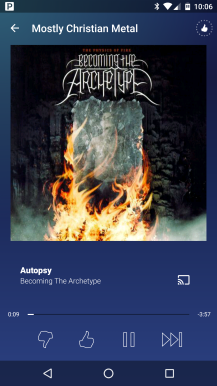 With music playing essentially all the time, I don't always know what I want to listen to, and that's why I love Pandora. 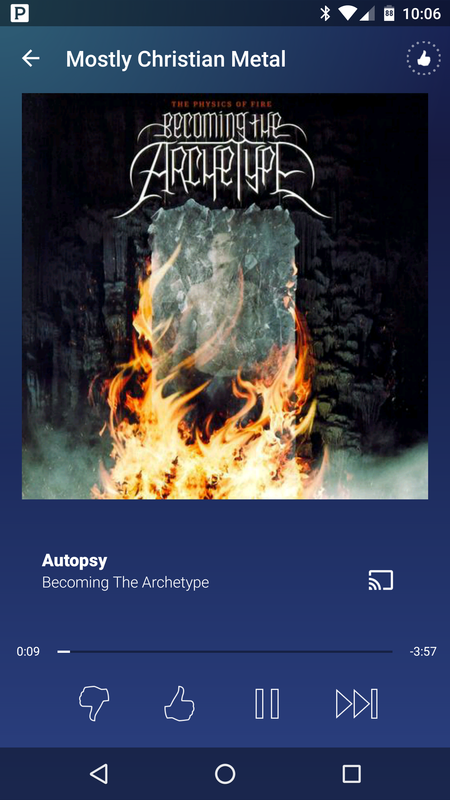 I'm also a Play Music subscriber, which is perfect when I know exactly what I'm in the mood for, but when I have no idea (or don't feel like trying to figure it out), Pandora does all the work for me. It's also great on long road trips because the data usage is like a fourth of what Google Play pulls down, which also saves me money. This is my bank, and I love my bank. I don't think there has ever been a point in time other than now when I could actually say those words, and Simple is completely responsible for that. Never before has managing money been so, um, simple—the days of balancing checkbooks and keeping a super-close eye on my finances are things of the past. 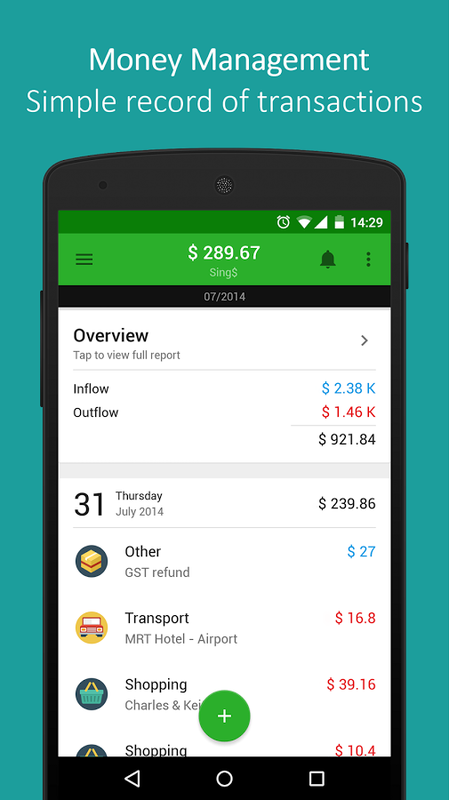 Simple has literally changed the way I deal with money in basically every way. I like to ride bikes. A lot. And you can bet that if I'm on any of my bikes, I'm using my Garmin Edge 510. This little gizmo changed the way I perform when I ride, because it shows me all the data I want to see—heart rate, cadence, etc. You know, important stuff. 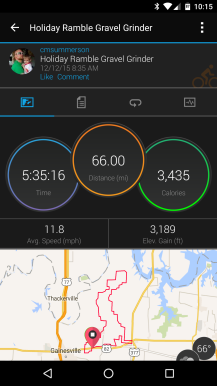 And when I'm done with my ride, the new version of Garmin connect shows me all sorts of awesome data, and also helps me keep track of all my past rides so I can keep my progress in check. 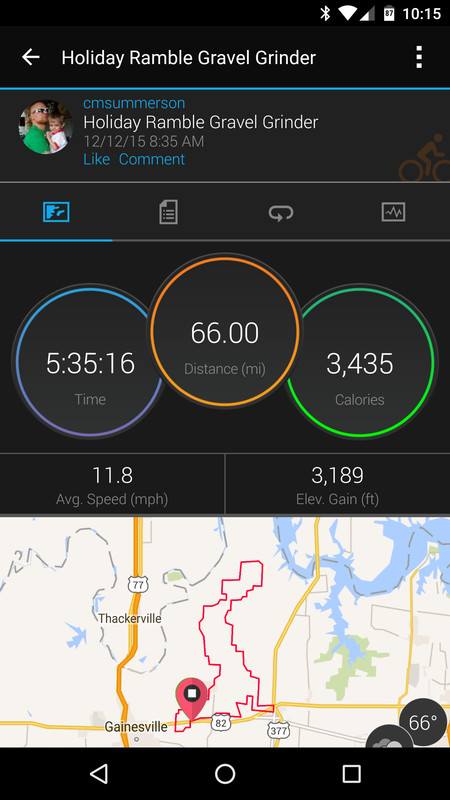 Strava really does the same thing, but also lets me see how my friends who ride are doing, too. I don't actually interface with Strava that much since my Garmin auto-uploads my rides, but it goes hand-in-hand with Connect, so it's on my list. I can't really imagine using one without the other. Cam might think he's a boring user, but I will defend my title as the most boring user in the world - my app collection is pretty small. 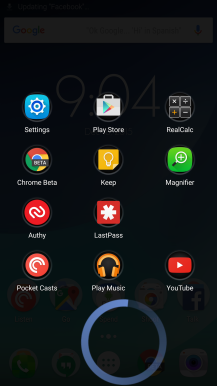 I cycle through tons of apps each month, constantly visiting the Play Store to grab something new, but outside some casual games, there are only a handful of apps that have become permanent residents on my devices (for now). Here are a couple of the apps I find myself using all the time. 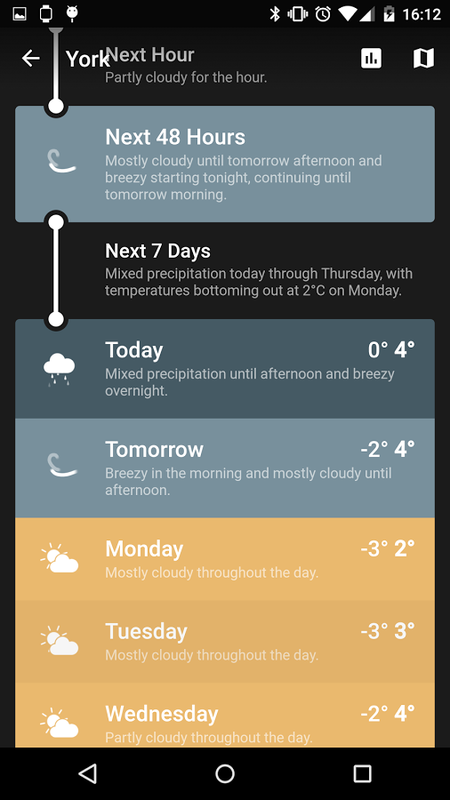 Weather Timeline is an app I talk about all the time, and it's a winner of one of last year's material design awards. 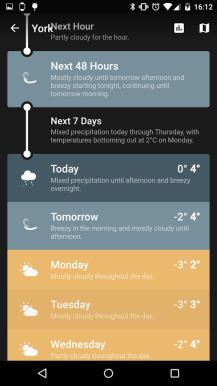 Weather Timeline is a weather app, which doesn't sound exciting at all, but it's so well-executed and thoughtfully designed that I can't imagine switching to any other app for my weather needs. As a matter of fact, I never considered myself to be a person with any weather needs until I installed Weather Timeline. Tons of weather info is all neatly laid out into a simple timeline with easy to read colors and typography, and icons that animate subtly to one side of each card. This is another app I take every opportunity to gush over. 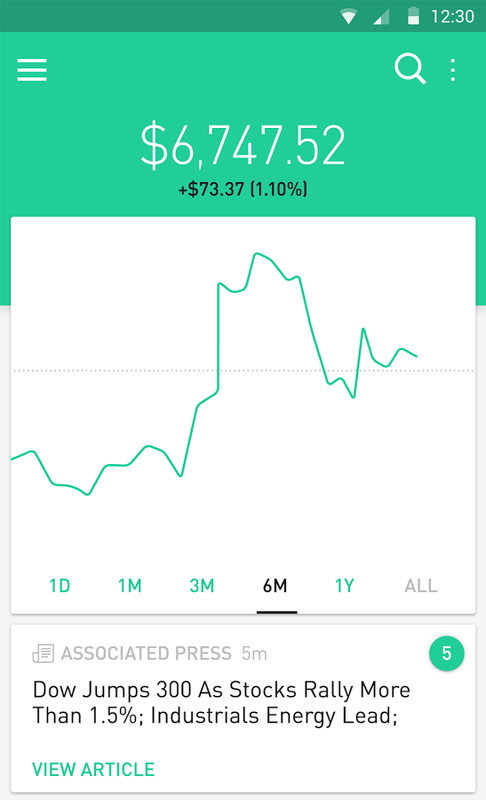 Robinhood is simple - users transfer money in from their bank account, and use it to buy stocks. It was invite-only on iOS for a while before coming to Android, but when it did arrive on our favorite mobile platform, it did so in style. It came to Android with a great material design, and maintained the dramatic typography and colors that made users feel excited (or terrible) about their daily progress. Colors change based on whether the market is open or closed, whether you're up or down, etc. and info is laid out in clean graphs with easy-to-read numbers. 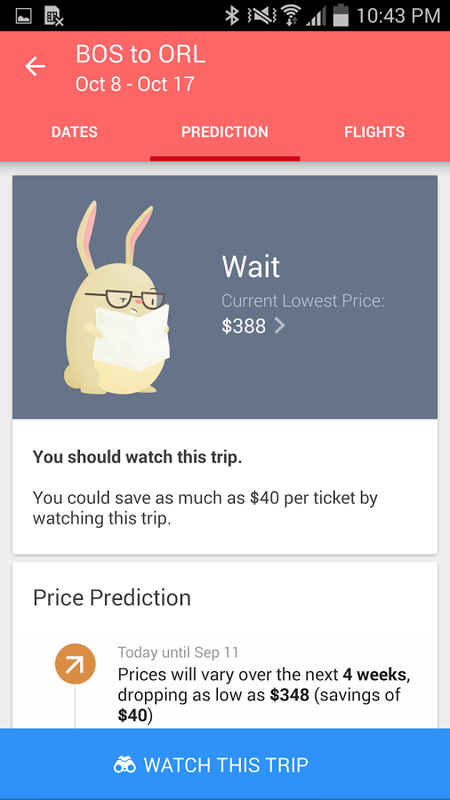 This app is a little more specialized than a weather app - Hopper helps you track flight prices but it also predicts when those prices will go up or down, so you can buy tickets at just the right time. As someone who travels a fair amount, this has been a really useful tool and it seems accurate so far, though I see a few server errors every now and then. 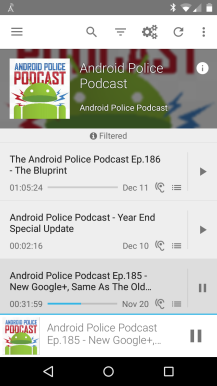 If you're the kind of person that reads Android Police, you're probably well aware of some of the best apps available for Android. Many of those (such as Google Photos and Pushbullet) are relatively well-known, racking up several million installs, and chances are you already have them on your device. Since I have the opportunity of being exposed to so many apps, I wanted to focus on the lesser known gems of the Android world. Here are a few of my favorite apps that (hipster alert) you might not have heard about. Type Machine is one of those apps that you rarely ever need, but are really glad you have it when you do. 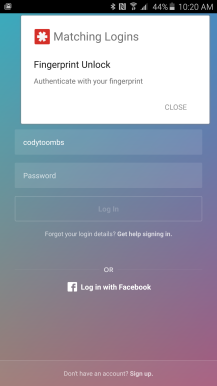 For the most part, the app sits quietly on your device, temporarily storing everything you type (excluding passwords). If you ever need to access some text you wrote, it's all right there waiting for you. I honestly cannot count the number of times this little app has saved me from having to rewrite some hilariously witty Reddit comment I spent half an hour on before my Reddit app crashed or I accidentally deleted everything. Type Machine has even got you covered if you tend to rewrite the same text sentence word paragraph a dozen times, allowing you to view and copy your history down to a letter-by-letter basis. You can also set up a PIN lock if you're worried about someone snooping around your lame attempts at romantic poetry. 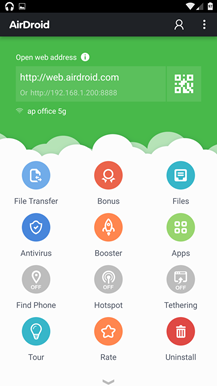 Unlike other mobile platforms, Android lets you actually access the file system on your device. Of course, you don't need a file manager to manage your files, but a good one goes a long way in making common tasks a lot easier. My favorite file manager — by far — is Solid Explorer 2. It offers all the features most power users will ever need, and it manages to do so while still remaining easy to use and being one of the best implementations of Material Design I've seen. 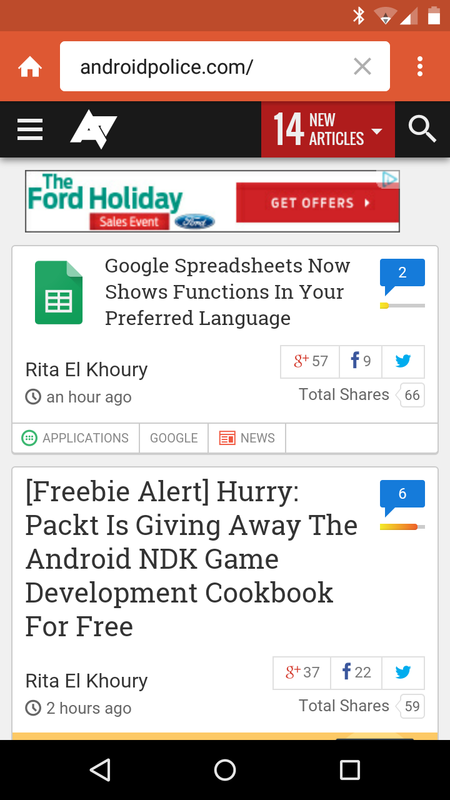 If you've ever used Link Bubble, you already know what Flynx is all about. Basically, it's a web browser that's been shrunk down to a floating bubble on your screen. It's a real time saver, since you can use it to open links and continue whatever you're doing while the page loads in the background. After becoming frustrated with all the stability issues I was having with Link Bubble Pro, I can say that using Flynx has been a breath of fresh air. 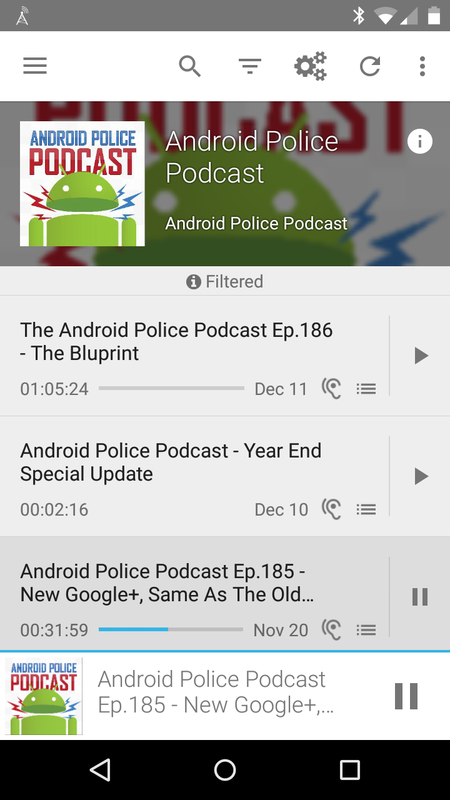 I'm a semi-regular podcast listener, and Pocket Casts is the best podcast app I've found on Android. 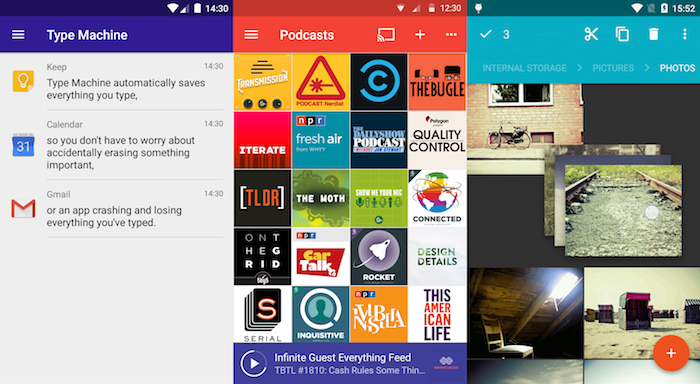 It's got a beautiful interface, loaded with material-y animations and transitions, and features a great way to search for and discover new podcasts. I like to listen to my podcasts at a faster playback speed than most people would be comfortable with, and Pocket Casts has me covered with one of the best speed-up algorithms around. As long as I'm not distracted doing something else, Pocket Casts makes it easy to listen to Liam's soothing voice at 2x the usual speed and still not miss a single word. With over one million installs, SeriesGuide can hardly be considered an unknown app. Still, it's one of my favorite apps, and since it's independently maintained by a single developer, I thought it deserved a mention. 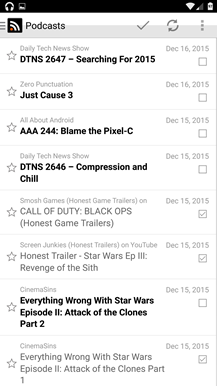 If you want to keep track of all the shows and movies you watch, SeriesGuide is the way to go. I'm a sucker for a great application. If something works well, makes life easier for me, and looks good doing it, then count me in. Many of my real life friends probably get annoyed with me continuously recommending a few apps over and over again, but I believe that great apps deserve to be talked about. Many of the apps on my phone are geared towards power users, but most of my friends aren't power users. So what apps do I talk about constantly that can be used by everyone? Well many are already discussed above or below, but here are a few of my go-to recommendations. Google Photos easily tops the list of applications I recommend the most. I've always hated the process of backing up, organizing, and maintaining my pictures. Having multiple cameras and computers makes it even more difficult. 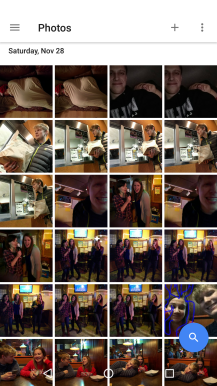 Photos is a standalone service that solves all of these issues and more. It's fast, functional, and simply awesome. My favorite features are free unlimited backup, creepy search tools, and the brand new collaborative photo albums. Looking for more information? I wrote about 4000 words on every aspect of Photos a few months ago. 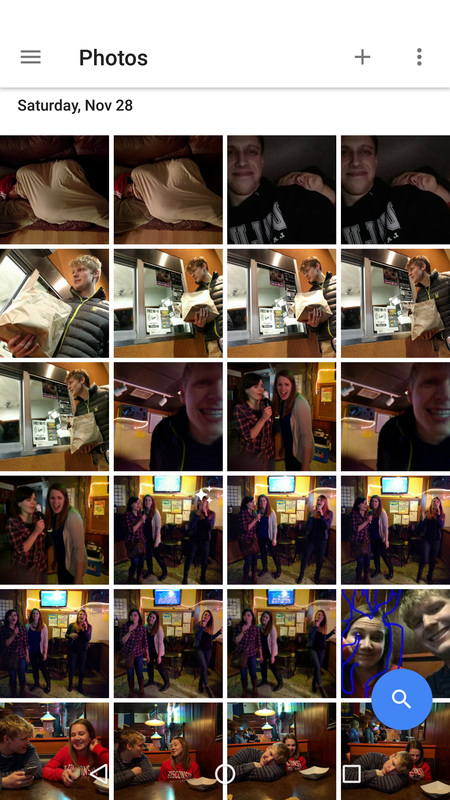 If you haven't used Google Photos yet, go do it now. 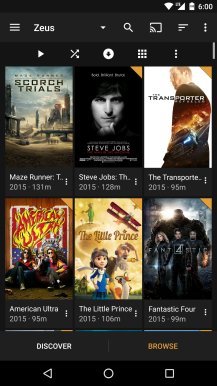 Plex is an app that I've been using for years to manage all of my movies and TV shows. The Android app has really improved over the last year, implementing material design, adding a discover section, and improving playback on many devices. The ability to sync movies directly to my device for offline viewing is wonderful for long road trips (when I'm not driving, of course). The Android app requires a Plex Pass, or a one-time fee of $4.99. If you know someone who hosts a Plex Media Server and want to use the app strictly for viewing their collection, the one-time fee is worth every penny. Inbox has completely changed the way I manage my email, which was probably the intention of the Gmail team when they created the service. I've been using it since the beta opened, and I don't think I could ever go back to Gmail. There are many things I love about Inbox: bundling related emails, seeing attachments and orders without going into the email, and quick access to my to-do list. Reaching Inbox Zero is a wonderful feeling, and it's extra special now that it's Star Wars season. It takes some time to get things set up if you have a ridiculously messy inbox, but it's well worth the trouble. It's no secret that I love a good deal. Heck, deal alerts are about 80 percent of what I write here at Android Police. With that in mind, it should come as no surprise to you that the three apps I have to share with you all will either save you some money, or put a little back in your pocket. 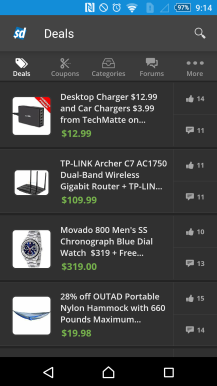 My favorite app for finding a killer deal is SlickDeals. 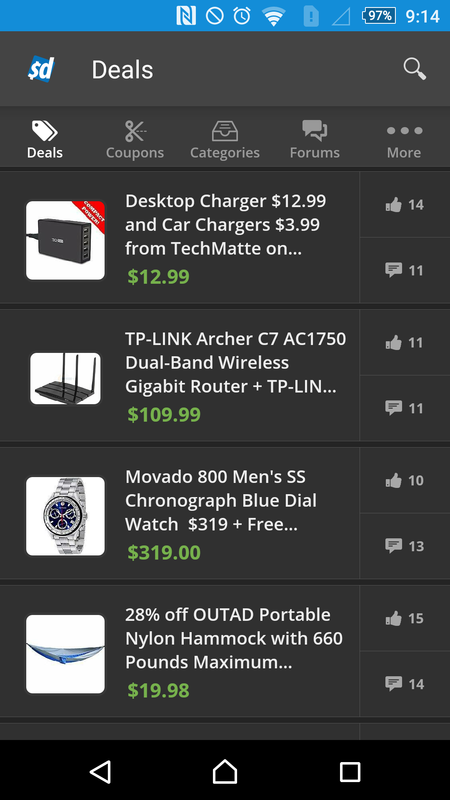 The app looks great, thanks to a recent overhaul, and deep control of deal alert notifications keeps me up to date on the latest bargains on the internet. 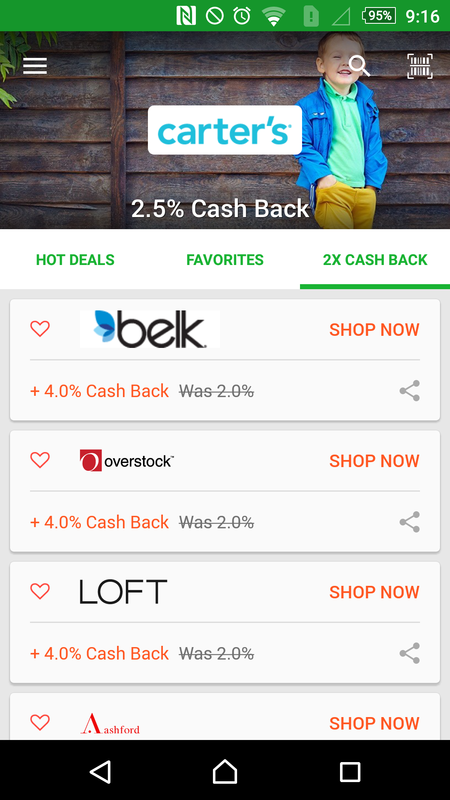 With a swipe I can navigate through featured, popular, and local deals, and integrated search makes it easy to find a good deal on whatever product I'm in the market for. The only issue I have with the app is that it has completely destroyed my impulse control. Man, I love a good deal. 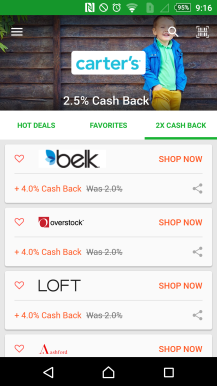 While Slickdeals saves me money by helping me find good deals, Ebates puts money back in my pocket for every purchase I make through hundreds of different online retailers. 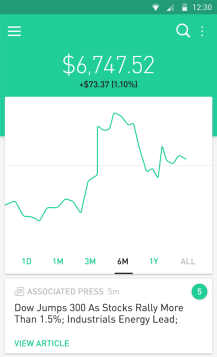 Since signing up for an account a few months back I've had over $100 paid out to me for making purchases through the app. Using it is super simple– sign in, select a retailer, click the link, and do your shopping. After you make your purchase, a certain amount is returned to your account. 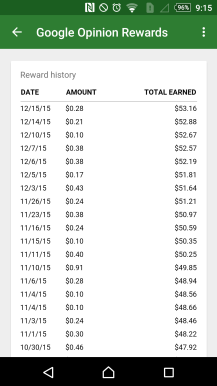 Once, every couple of months, Ebates pays out the cash you have accumulated with a check or through PayPal. The rewards are well worth the small inconvenience of starting a transaction through the app. Starting to notice a theme here? Yes, I like apps that save me money. I also love finding ways to make little extra money. 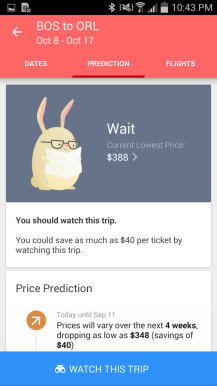 That's precisely why I love Google Opinion Rewards. The concept of the app is simple. The app notifies me that Google has a short (like 3-5 questions) survey for me to answer. 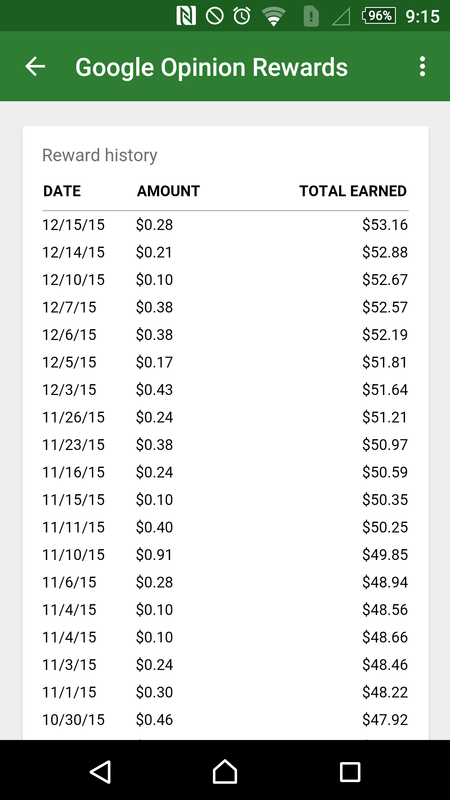 I answer the questions, usually in about 10 seconds, and 10-50 cents of Google Play is added to my account. It may not sound like much, but I've had over $50 in credit added to my account since I downloaded the app, and I can't remember the last time I had to pay for an application on my phone. What about you? 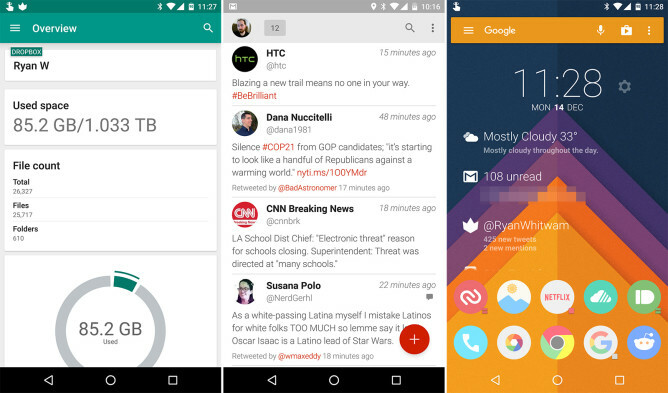 What were your favorite apps to use this year?